Chubby hands held a measuring cup, poised to dump in more flour as her brother stirred. The eldest read the recipe aloud while the baby beat the linoleum with a wooden spoon. The big brothers wore dinosaur aprons, and little sister had a tea towel tucked in her sundress. This scenario is a fond memory with my children. Yes, it was messy and noisy, but what about childrearing isn’t? And while my youngsters had fun making bread or cookies, they also learned about maths, chemistry and nutrition. That middle son graduated from culinary school, and is now a chef in New York City. Best of all, every one of my brood can cook. Learning one’s way around the kitchen and the basics of food preparation is a life skill. Like breathing and sleeping, we must do it each day, so why not get your kids in the kitchen? They generally eat what they enjoyed creating, so keep it fun. 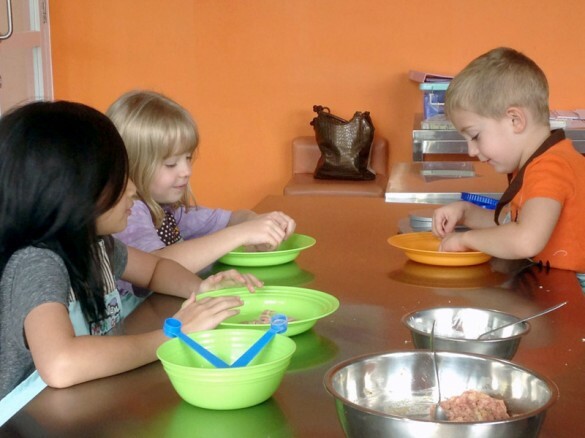 For the youngest ones, it is a hands-on chance to make a positive connection to food as raw ingredients become meals. 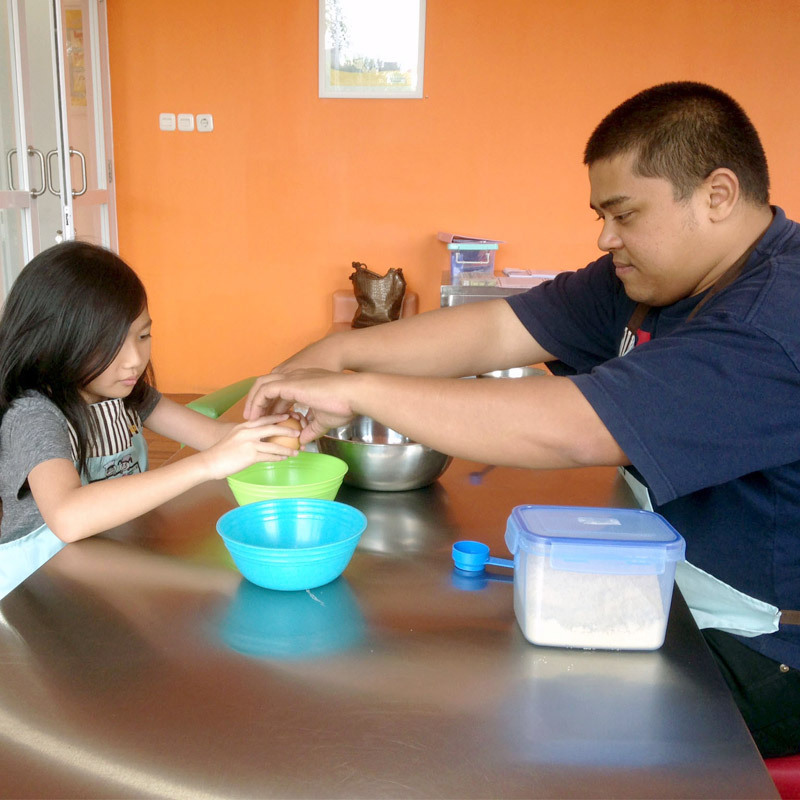 Elementary age children learn about steps in a process by following directions, measuring, mixing and baking, while teens grasp concepts like meal planning and budgeting. If your child has special dietary needs, they can be taught how to address them. The whole family can be involved with field trips to fish or farmer’s markets and pick-your-own farms to understand food sources. It is vital to supervise children in the kitchen and offer them age-appropriate tools to keep them safe. Offer them good access with step stools or lowered surfaces, such as a children’s table. Stay-put silicone mats stick bowls in place, and for preschoolers, stirring with chopsticks instead of spoons will keep the mess to a minimum. Little hands should use butter knives or plastic cutters, and when peeling vegetables, teach them to push away. Keep gadgets to a minimum to gain competence in basic skills. As you work together, kids will gain an overall appreciation for food – its variety, healthful aspects and the work involved. It takes time and patience initially to have kids in the kitchen, but the mess gets less with practice. It also is a great way to disarm the witching hour that precedes the evening meal. 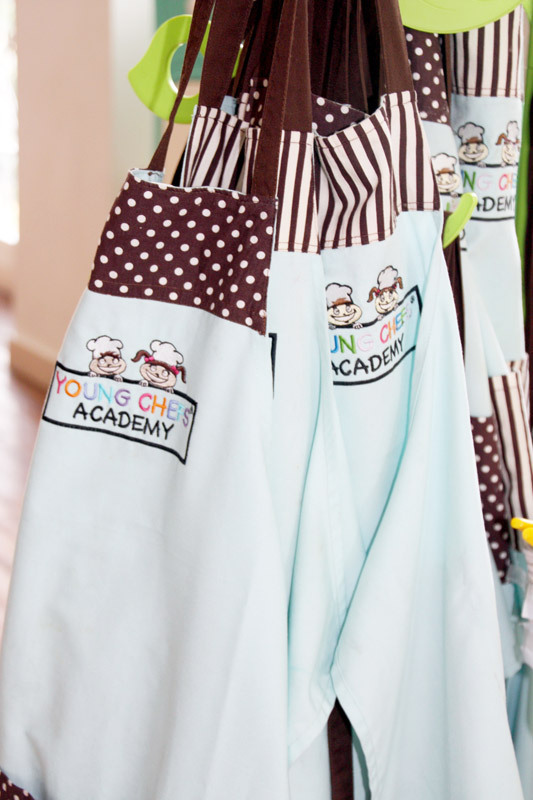 At Young Chef’s Academy in Jakarta, children are grouped by age to learn kitchen safety, proper food handling, preparation, cooking and baking skills, presentation, table setting and manners. On a typical weekday, Chef Gori was instructing three children, ranging in age from four to eight years old. They took turns as their abilities allowed, reading the recipe, measuring ingredients and mixing. As the kids dipped potato chunks into seasoned mayonnaise and bread crumbs, the youngest boy giggled with glee, wiggling his cornbread crumb fingers. Every recipe needs a heaping helping of good humour. In between steps, like real cooks, the kids washed their hands at the sink again and again. When the meal of stuffed cheeseburgers and seasoned fries was ready, the children set the table, and then, sat to enjoy their meal. Chef Gori often makes pasta in his cooking classes. “People don’t realize how easy it is,” he said, “just flour, an egg and salt, and plenty of fun to roll out the dough and put it through the pasta machine.” The school breaks the classes into Kindercooks, aged three to six years; Junior Chefs, aged seven to 12 years; and Senior Chefs for 13 years and above. Birthdays are often celebrated at Young Chef’s Academy for a practical party set-up. Additionally, orphanages and special needs children are welcomed into the kitchen. Now, it’s time to get some eager hands in the dough and practice those skills with this easy recipe, suitable for grade-schoolers. Mix water and yeast, brown sugar and salt in a large mixing bowl. Let stand five minutes to bubble and proof. Add flour and stir until dough is smooth. Add more if sticky. Cover with plastic wrap and let the bowl sit for an hour or longer (even in refrigerator overnight) to allow dough to rise. Divide dough into 12 pieces on counter. Roll each piece into a pencil rope. Shape dough into pretzel—loop, twist ends and drape across bottom—and place on parchment paper on a cookie sheet. Repeat with remaining dough pieces. Let the pretzels rise for 45 minutes to double in size. 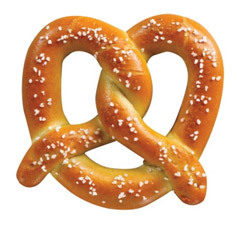 Gently dip each pretzel into soda water solution, and then, brush with egg. Sprinkle with kosher salt. Bake pretzels in hot oven, 230 degrees for 12-15 minutes. Brush with melted butter, if desired.